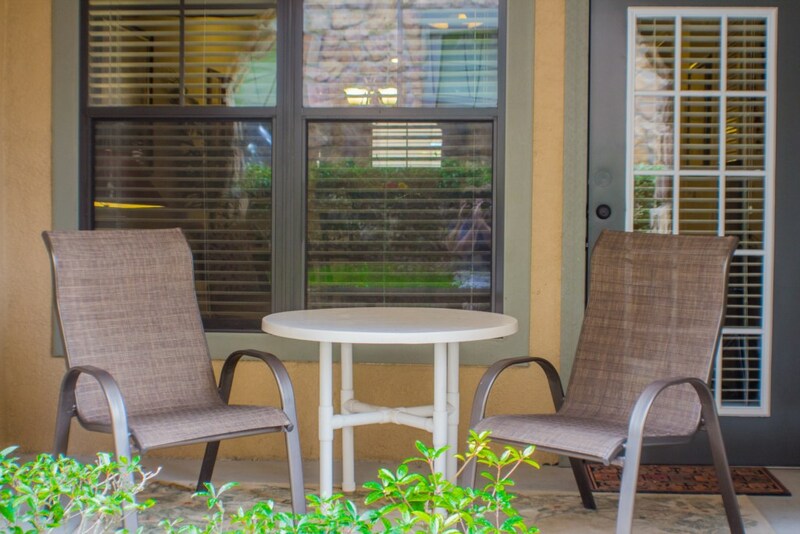 Located in Bella Piazza, this condo is perfect for a small family, a few friends, or those on business. 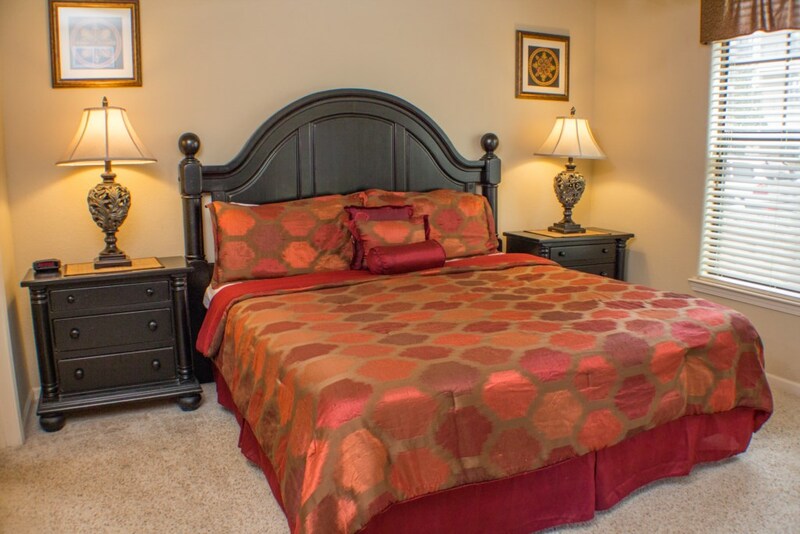 With 2 spacious bedrooms and 2 full bathrooms, this home sleeps 6. Situated on the ground floor, this is a highly desirable rental with its convenient location and small paved patio area outside. 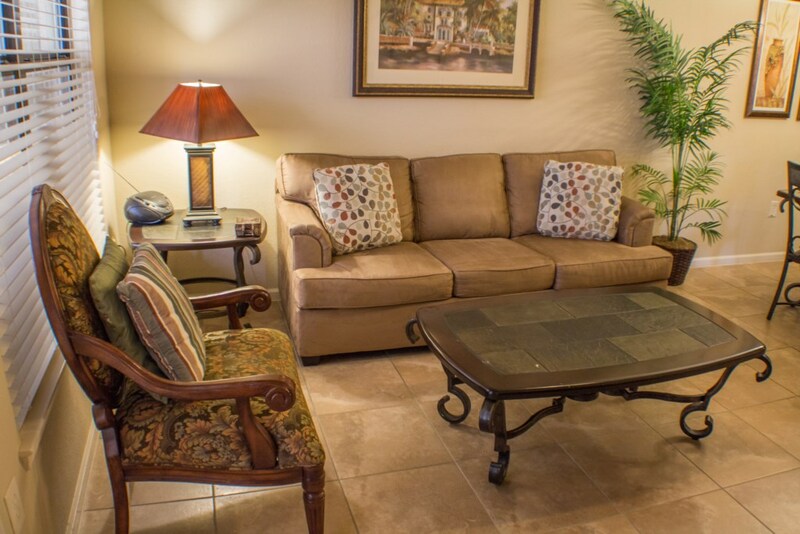 All the resort’s facilities are just 30 yards away. A lot of thought has gone into the planning and design of this home, and great attention to detail has been paid from the windows to the crown molding that can be seen throughout the home. The dark wood paneled kitchen set gives the kitchen a country-rustic feel while the stainless-steel appliances and marble tops add a sense of sophistication. 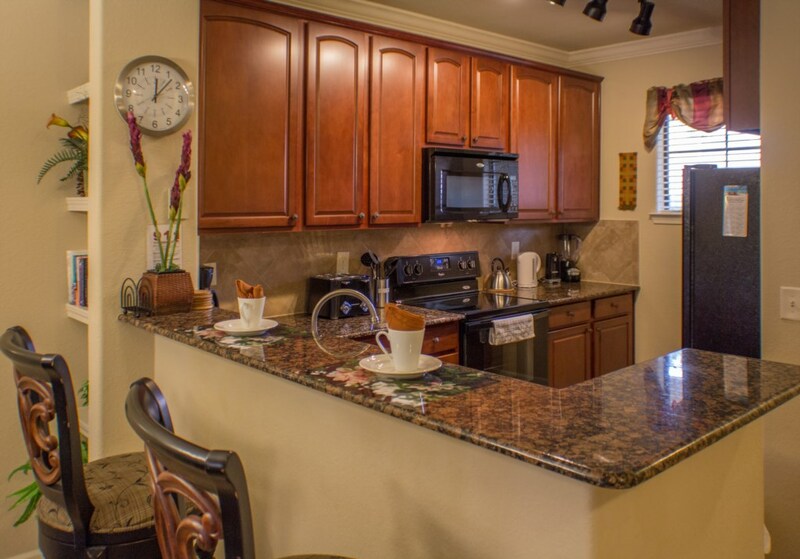 The kitchen is fully-equipped with all the kitchen appliances you need to make a meal for your friends or family. 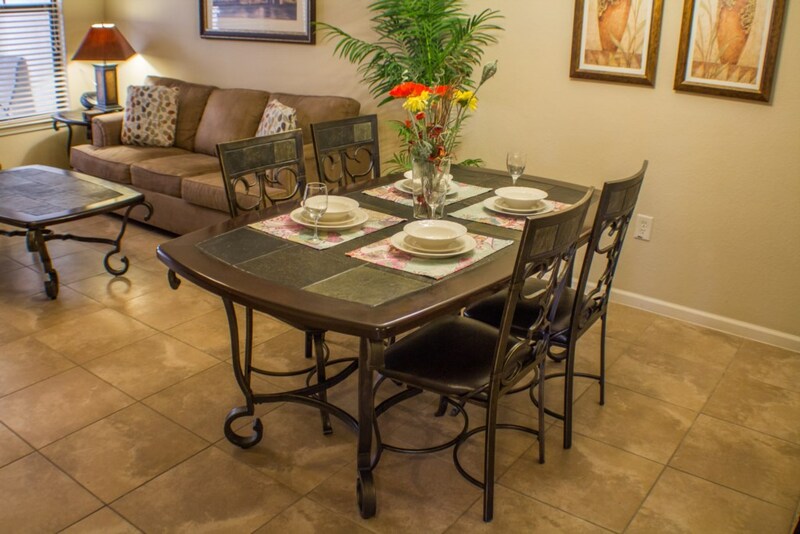 Located right next to the tiled kitchen is a small formal dining area that has a beautiful dark wooden table and 4 wrought iron and wood chairs for guests. Next to the dining space, there’s the comfortable living room that has a large comfy sofa, which also pulls out into a bed, and 2 arm chairs. There’s a TV, a DVD player and VCR player. 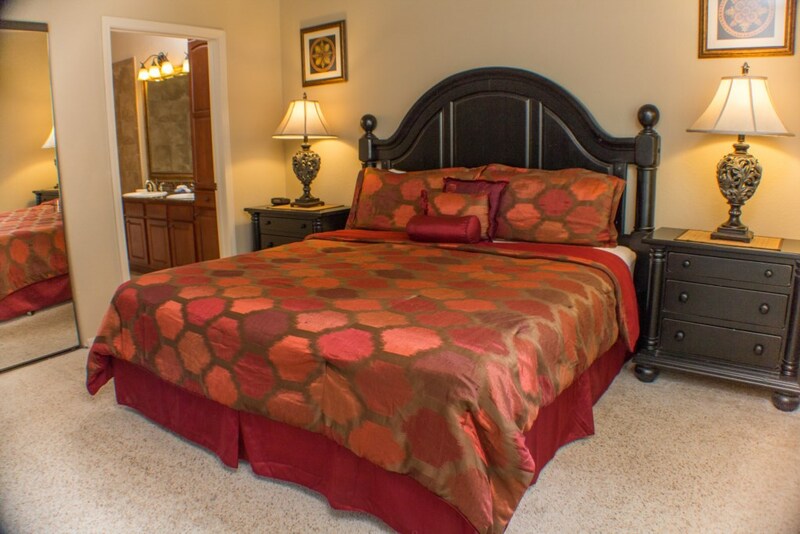 The master bedroom has a king-size bed and en-suite bathroom. There are his and her vanities, overhead spotlights, and a large mirror. 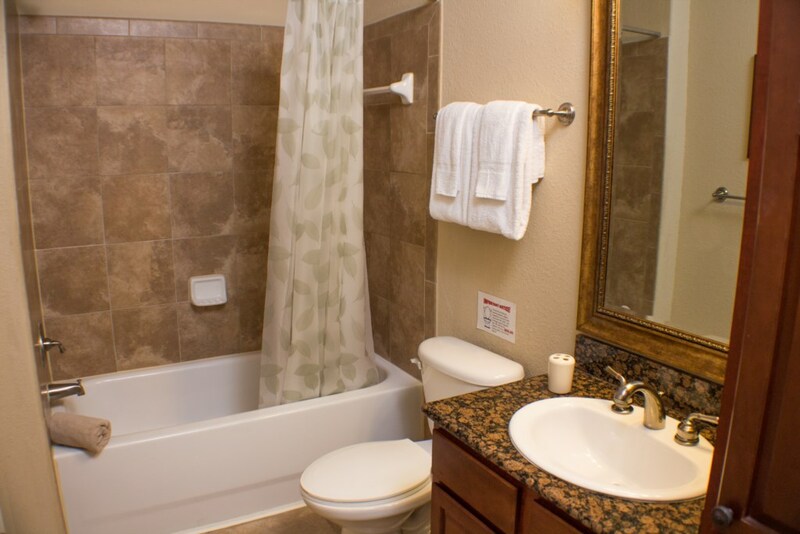 Those staying in the master bedroom will enjoy their large garden tub and separate walk-in shower. 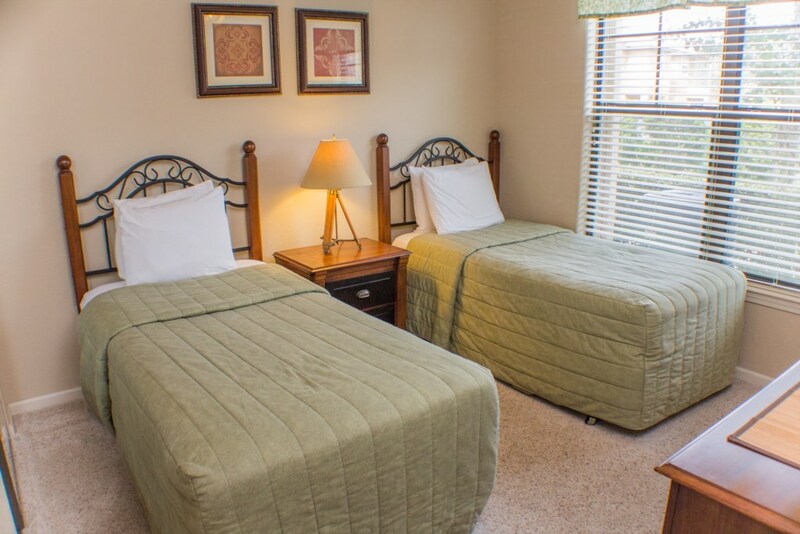 The second bedroom is a twin room, which features beautiful wrought iron beds and wooden furniture. Additionally, the room also has a large wardrobe with a sliding mirror door. 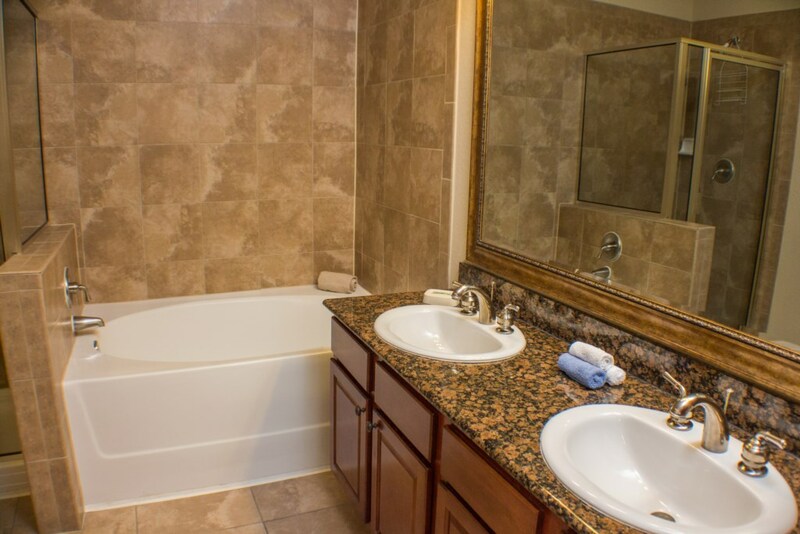 There’s also a full-sized communal bathroom, which is beautifully tiled and has a large bathtub and overhead shower. If you have a baby, there’s a highchair and a pack n’ play available for use. Every single room in the condo is fitted with a ceiling fan. Need to do some laundry? There’s a washing machine and dryer that can be found in a larger closet of the condo. Bella Piazza combines the ambiance of a modern resort community with the elegance, comfort and beauty of traditional Mediterranean style buildings. 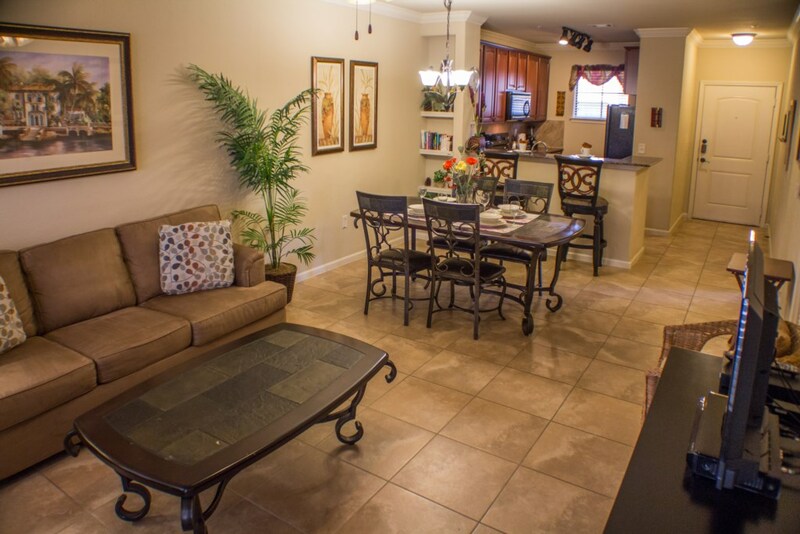 The community has condominium units ranging from 2 bedroom / 2 bathroom condos right up to 4 bedroom / 3 bathroom condos. For those units above the first (ground floor), the buildings all have elevators for your convenience and are all within easy walking distance of the magnificent resort-style facilities.